Plumbing emergencies always seem to happen at the worst time. The truth is that there is never a good time for a plumbing emergency in Naples, Ft Myers,Estero, Bonita Springs and San Carlos Park, FL. Knowing who to call can make the situation a little less frustrating. At Moen Brothers Plumbing & Drain, We stand ready to solve your emergency plumber service or clogged drain cleaning issue fast, at any hour. During an emergency plumbing situation, it may be hard to get three estimates. You can count on Moen Brothers to be the honest, dependable, and affordable emergency plumber. Our technicians are not paid commission, so you can trust us to perform only what is needed at a reasonable price. In a Naples, Ft. Myers, Estero, Bonita Springs and San Carlos Park, FL emergency plumber situation, you’ll need to know how to stop the flow of water quickly. Make sure each and every member of your family or office staff knows where the main water shut off valve is located. Knowing where this valve is and ensuring it works properly could save you thousands of dollars in water damage. An entire home sewer back up can be frustrating. Many emergency customers call saying, “there is sewage coming up in my showers and I can’t stop it”. In this case you need to stop running water in your drains and turn off appliances like dishwashers and washer machines. These appliances have pumps that continue to pump water into a backed up sewer line. If you live in a multi- family home, the sewage could be coming from the neighbors above you. Many multi-family homes have common sewer lines, ask the neighbors above you to also stop running water and to turn off appliances. 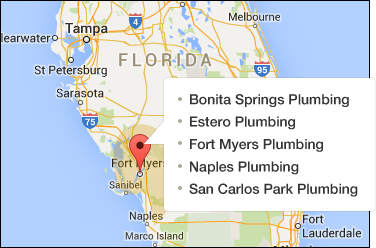 Call the Moen Brothers and speak to an emergency plumber in Naples, Ft. Myers, Estero now. During an emergency, we understand your need to speak to an emergency plumber immediately. An actual plumber in your area will answer your call, never an answering service.